Everybody has different tastes and giving everybody identical plasmid maps is unfair! So MacVector is designed to be as flexible as possible to allow you to make your maps look like YOU want then to look. In this theme was a recent change where appropriate features can be shown as residues when there is sufficient space to show them (for example when zoomed to residue). By default this is enabled for certain features. But it is controlled from the Symbol Editor (double click on a feature to edit it). 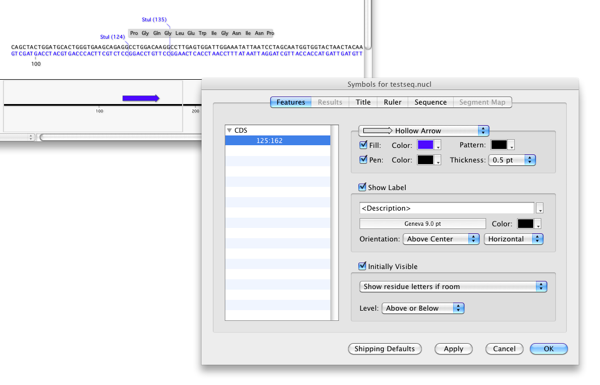 For example if this is enabled for a CDS feature when zoomed to residue the amino acid (either 1 letter or 3 letter codes) will be shown. This entry was posted in Techniques and tagged map view. Bookmark the permalink. Both comments and trackbacks are currently closed.